Constructed of super soft, durable neoprene pads, Footrest Leg Bumpers wrap around the wheelchair footrest support bars to provide long lasting comfort for wheelchair users. 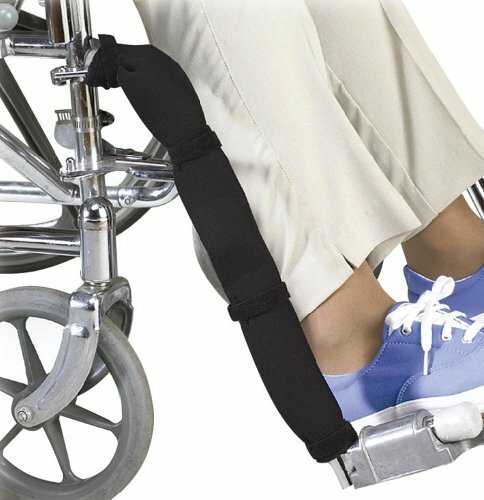 Featuring Velcro tabs that securely fasten to the wheelchair support bars, the Footrest Leg Bumpers do not shift or move from desired positioning. Ideal for any type or size of wheelchair, the Footrest Leg Bumpers are sure to provide superior comfort and stability to wheelchair users for extended periods of time. Soft, durable neoprene pads wrap around wheelchair footrest support bars. Hook and Loop provide easy and secure application. Designed to fit all wheelchairs.